instant – whenever you want it! Change how you feel at the push of a button, whenever you want a boost. Choose how you want to feel and let an expert guide do the rest. Customize your experience for the length of time, music, vibe and experience you need – over 400 combinations in all! events shape how you feel? If you want to climb into bed and go to sleep but your mind won’t settle, you might feel frustrated and tired. If a friend, family member or co-worker says something unkind, you may feel hurt or disappointed. WHEN YOU OPEN THE GRACE SPACE APP, I’LL ASK YOU A SIMPLE QUESTION. AND THEN? LET ME DO THE REST. HYPNOSIS ISN’T WHAT THEY SHOW ON TELEVISION. It’s not a stage show. It’s not about controlling someone’s mind. And it’s definitely not about making people cluck like chickens, either. It’s all about getting into a relaxed and receptive state where your conscious mind is open to change. Most people can hypnotize themselves and some people hire certified professionals to guide them. Some of our customers like to do a session before bed, to help them relax and prepare for a refreshing night of sleep. Other people do sessions before a tough conversation or meeting at work, and they’ve got 10 minutes to ground and center. And other people create a morning ritual where they listen first thing in the morning to set the tone for a great day. However you choose to do your sessions, know that it’s a cumulative process. Whether you do a session every day or you prefer to do a few sessions a week when the mood strikes, each time you do a session, you are rewiring your mind and emotions to put you in the driver’s seat of your own life. The more sessions you do, the more you’ll train your subconscious mind to choose how you want your life to be – and how you want to feel – first . You will stop reacting to external events. You will stop letting other people’s actions control how you feel. And best of all, you will start to notice your life getting better and better, in the most gentle and wonderful ways. 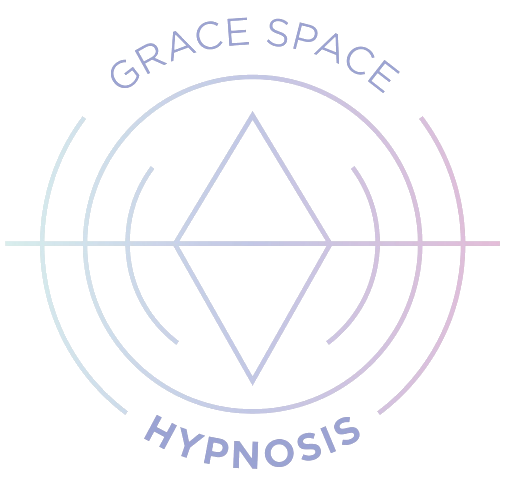 Grace’s hypnosis has helped me for the past 4 years, from completely eliminating anxiety around food, detaching from negative relationships, and even increasing my financial abundance. CAN I LISTEN TO PURCHASED SINGLE RECORDINGS VIA THE APP? While it is possible to download purchased individual hypnosis recordings to your mobile device, this is not achieved via the app. CAN I USE MULTIPLE RECORDINGS IN THE SAME DAY? I always recommend listening to one recording at a time until you experience the results you desire. My favorite time frame for conditioning is a minimum of 21 days in a row with the same recording. If after 21 days you are still not seeing 100% of the results you are looking for within that topic, continue with your conditioning until you do. When we listen to too many different topics simultaneously it tends to dilute the results across the board so I would never recommend listening to, for example, a weight loss recording with a public speaking recording. However, a weight loss recording and a self-love recording would be a pairing that could work simultaneously. I still recommend listening separately for 21 days but I know many people want to dive in sooner than that, so if you do, just make sure the recordings are very much related. To log in to the app, tap on the hamburger menu on the right side and then tap on “Log In”. If you haven’t done so already, create an account by pressing the “Create a Grace Space App Account Now!” button. Here you can enter your email address and a password of your choice. Alternatively, you can register using your Facebook or Twitter account. This login will be separate to your Inner Circle or Inner Circle Elite login. The app will remember your login details so that you don’t need to type them in each time. IS AN INTERNET CONNECTION REQUIRED TO USE THE APP? All of the backgrounds and recordings are streamed to your device so your device will require either an internet connection (mobile data or Wi-fi). If you need to recover your password, tap on the “Forgot Password” button and enter your registered email address on the next screen. Press the “Reset Password” button to receive a secret code via email to reset your password. I bet you’re here because there’s something in your life you’re looking to improve. That’s wonderful! Because making your life better always starts with a desire. And you’re here – so you’ve already got that. But what you may not have yet is a proven tool to help you make the change you want. Maybe you’ve read books. Maybe you’ve tried other techniques. Maybe you’ve even changed for a little while . . . only to have fall back into old habits you don’t want. – AND MAKE SURE IT ‘STICKS’ – YOU NEED THREE THINGS. A simple, enjoyable method that’s known to make lasting changes, led by a master practitioner who’s seen it all. Join our private and intimate Facebook group available for Inner Circle members only. Receive personal attention from Certified Grace Space Hypnotherapists and hypnotherapy sessions tailored to the group – be part of a vibrant community of positive, upbeat people who are taking 100% responsibility for their lives — just like you ! Our app helps you change state immediately, whenever you want it. Every weekday, be guided through a LIVE session with a certified Hypnotherapist in our private and intimate group. This is a safe space for you to share your journey and get direct help from Grace and our vibrant Inner Circle community. How do you want to feel? Tell our app and listen to customized hypnosis sessions based on your preferences. What’s inside the Inner Circle Hypnosis Library? More than 37 single session audio tracks (runtime approximately 22 minutes) and 15+ full-length series and challenge audios (a sequence of several sessions over 7-21 days around a specific topic or result). We’re adding new singles and series every month — plus, you’ll also be able to unlock Grace Space legacy content — videos and broadcasts on our most popular topics. Our Think Happy Series will help you release mental blocks that stand between you and true happiness. We will go deep into your subconscious mind and guide you through suggestions that will reinforce happy thoughts and make it a new habit. This is a foundational series for our Grace Space members. It will take you from A to Z when it comes to conditioning your subconscious for happiness and success. Get ready to explore and surpass your mental barriers with our Mental Bootcamp Series. Be guided by Grace Smith in a journey of uncovering hidden fears that may be holding you back and unleashing your ultimate confidence. This series will help you let go of any limiting thoughts from the inner-most part of your being and flood your body with energy to accomplish what you desire. Procrastination to Productivity is a seven-day course which will help you to identify what your key “takedowns” are in order to negotiate success with your subconscious mind. You’re going to focus on getting the biggest tasks accomplished first, and you’re going to reestablish a more productive view of yourself. Over the course of 7 days you’ll train your brain to love your body now so the habit will be in place while you begin to shed those pounds and attain your weight loss goals, once and for all. You are worthy of sharing your voice with the world. Every day throughout this series, you will become more and more relaxed about public speaking. Not only will you become more comfortable with speaking in front of others, but also you will feel free to speak up for yourself. This series has the overall arc to work across time from the past through the present to the future and back to the present. It will enable you to sort through events of the past, take control and create your present life, see the life of your worthy ideals in the future, and then return to live your optimal present life. The Quit Smoking Series is what you’re looking for if you’re ready to let go of cigarettes. We’ll actually begin by cutting down and working our way towards “The Quit Day,” and we’ll reinforce the suggestions to make sure you don’t crave cigarettes anymore. In this series, you will overcome your fear of flying and a fear of death, which goes hand-in-hand with a fear of flying. Not only will you get to the point where you can calmly imagine – and have – a wonderful flying experience, but also you’ll reprogram your mind so that if there’s turbulence, you will relax even deeper. In this 7 day course you will lay a foundation for peace in your mind, learn how to turn down the anxiety dial in your life, how to feel safe, how to create a new identity for yourself which includes you as a relaxed, happy person, and train your brain how to relax deeply, quickly. Do you want to go deeper and get exclusive instructional videos on exactly what to do when you are on offered sugar on social situations, on how to overcome childhood-related sugar attachments, and much more? Then this series is for you. When you join Grace Space Inner Circle, you’ll receive a link to join our private Facebook group for members-only, where our daily live sessions will take place. You’ll also receive 50 credits that you can use to unlock the singles, series, and challenges you want. Singles are 15 credits, series are 50 credits, and challenges are 100 credits. Every month, you’ll get 50 new credits that you can use right away to unlock more tools to improve every area of your life. For best results, we recommend working with one transformation at a time. For example, if you want to stop procrastinating, start with the Procrastination to Productivity series. Or if you want to receive more abundance in your life, start with our popular Abundance Challenge. You’ll also be able to unlock legacy content — our former courses, and instant access to Periscope archives, and videos on our most popular topics like financial abundance, relationships, and productivity. IMPROVING YOUR LIFE, WITH EXPERT GUIDANCE AND FULL SUPPORT! CAN I WORK ON MORE THAN ONE TOPIC AT A TIME? It is highly recommended to complete one series or challenge at a time. This will maximize your benefits, as focusing on too many different topics at once can dilute results across the board. Hypnosis itself is a deeply relaxed, highly focused state. The more focused you are on the specific results you desire, the faster you will experience them. We recommend choosing one topic and focusing on it until you are experiencing the results you desire for at least 21 consecutive days. At that point you can move on to the next topic knowing that your previous work is already solidified inside your subconscious mind. HOW DO GRACE SPACE INNER CIRCLE CREDITS WORK? Here’s how you get them and how to use them! Each month you stay as an Inner Circle Member you get 50 credits. Each month you stay as an Inner Circle Elite Member you get 150 credits. You can use credits to unlock singles, series, and challenges. Why do we do that? So that you can focus on 1 transformation at a time! Each series and challenge builds upon the prior day and it’s very important to finish the course you’ve started! Mixing multiple topics could hinder your progress and the credit system was a perfect way for you to control which advanced course you want to focus on! If you REALLY need to access other content, you can always purchase additional credits. 3- You will be taken to a quick video from Grace and then a confirmation page. Make sure to click through to confirm your cancellation. Get personal monthly phone sessions with the certified Grace Space hypnotherapist of your choice. Decide what you want to work on in your session. Schedule a one-on-one hypnotherapy session, every month. Hypnosis on its own will change your life. Along with the full member benefits of our online community and app. and you’ll get 150 credits + a monthly hypnotherapy session right away. Each month, you’ll get 150 more credits, that you can redeem for advanced hypnotherapy singles, series, and challenge audios, and more in our Grace Space Inner Circle online community. That’s in addition to your monthly hypnotherapy session. THIS IS THE MOST AFFORDABLE WAY TO RECEIVE PRIVATE ONE-ON-ONE SESSIONS WITH A CERTIFIED HYPNOTHERAPIST – AND REAP FULL MEMBERSHIP BENEFITS OF THE GRACE SPACE INNER CIRCLE COMMUNITY. sought after, and professional hypnotherapists in the world. When you have a private session with one of our certified Hypnotherapists, you know they’ve been trained to the highest and most rigorous standards in the industry. Which means one thing: each session you do can change your life for the better – for good. Choose Inner Circle Elite and in addition to your monthly private session with a certified Hypnotherapist. You’ll get complete membership to the Grace Space Inner Circle – including a library of more than 37 quick single session audios, and more than 15 full-length audio courses to overhaul your thoughts on popular topics like: Wake Up With Grace, the Ultimate Anxiety Relief, the Weight Loss Intensive, The Confidence Boost, Dominate Public Speaking, from Procrastination to Productivity. Use these audios between private sessions to keep you on track towards your goals! What’s more, Inner Circle Elite also comes with a subscription to the Grace Space App – our popular and fully customizable app for iOS and Android that helps you boost your mental state in an instant… whenever you need it. Bottom line? As an Inner Circle Elite member, you’ll have the private, personal attention to help you make profound, lasting changes in your life – fast — plus you’ll get the ongoing support, resources, tools, and community to make those changes a lasting part of the ‘new you’… for good! 12 sessions are truly the “tipping point” for lasting transformation. While the average presented in this study was 6 sessions for 93% recovery, we have found that most of our clients completely work through an entire issue in less time, approximately 3-4 sessions, which means that with a package of 12 sessions you are able to address approximately 3-4 areas of concern. We have found that with 12 sessions we are able to access and resolve the root of an issue, which transforms the client in every facet of their lives. Of course, some topics require more sessions than others, weight loss being one of them. If a client needs to lose 100lbs, that cannot be safely done in only 3-4 sessions and therefore an entire 12 session package (and perhaps an additional package or two) may be used for the various factors affecting the client and their need to lose weight. WHERE DO PRIVATE HYPNOTHERAPY SESSIONS TAKE PLACE? All of our private sessions take place over the phone on our private conference call line. Each session is approximately 45-minutes in length. The number and access code will be provided to you once your first session has been scheduled. We choose to conduct all of sessions over the phone because it extends the length of time that you can enjoy the deeply relaxed state of hypnosis. Rather than the stressful experiences of traffic, finding parking, and rushing to make your session on time, we find that our phone clients show up very relaxed to their session and often times even take a bubble bath, read a great book, or go to sleep immediately following their sessions – how relaxing! This elongated period of deep relaxation lends itself to greater efficacy during the hypnosis session and, therefore, even better results. Our sessions do not take place over Skype or other video conferencing programs because we have found that video conferencing tends to have more connection issues than a phone. We recommend wearing headphones like this (please make sure to purchase headphones that are compatible with your phone) which include a microphone on the wire so that your hypnotherapist can hear you clearly even once you’re deeply relaxed (when we become deeply relaxed, we also often times become very quiet). Recordings of the session are not included or provided. Custom recordings that are written and recorded for you outside of the session can be purchased for an additional $100 per custom recording.